Today's featured Mixologist is Charlie Zeiler, Lead Mixologist at The Mix Up Bar at The Royal Palms Hotel in Scottsdale. Charlie grew up in a small town outside of Toledo, Ohio where his family had a mom & pop grocery store. He moved to Phoenix in 2000 and started his bartending career at the Pointe South Mountain Resort, now the Arizona Grand Resort. After moving to California for a year to work for Marriott, Charlie moved back to Phoenix where he opened JW Marriott Desert Ridge Resort. 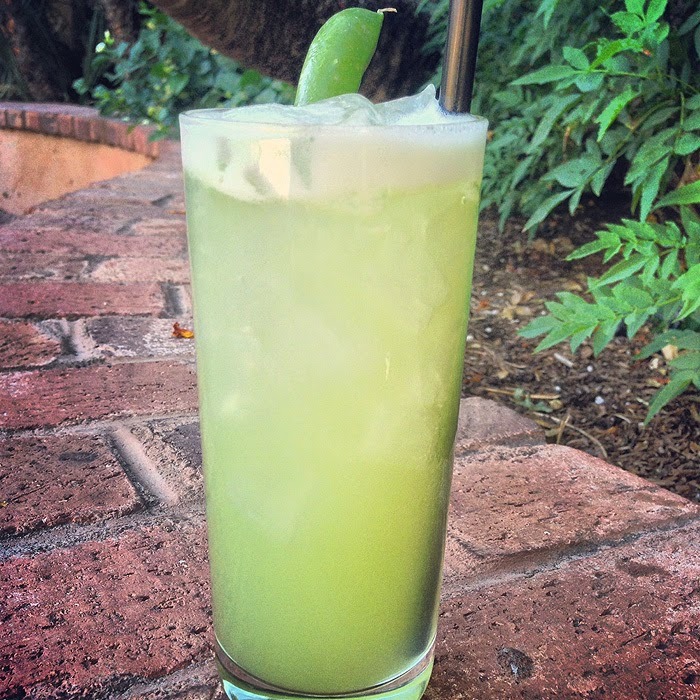 In 2013 Charlie joined Royal Palms Resort where he created the Green Acres Cocktail. The Green Acres came about when Charlie was asked by Chef Paul McCabe to come up with a drink that would pair well with an appetizer made with English peas. Charlie says that the syrup from the snap peas reminded him of sweet corn and picking vegetables when he was a child and immediately brought to mind the Green Acres song. Paired with Farmers Gin Charlie tried the syrup in a few styles of cocktails before he decided it worked best as a Collins style cocktail. Mix sugar and hot water until sugar is dissolved and let cool down. This makes a simple syrup. Add snap peas and simple syrup to blender and puree for 1 minute. Let the mixture set for 1 hour, then strain through a fine strainer and store in a refrigerator. Crisp and refreshing, my compliments to the Mixologist. Oh yes, this is for me!! YUM! Snap pea syrup? Oh my - how awesome!! Gotta try this. The color is so pretty. This sounds like the perfect summer cocktail! I'm so intrigued by the snap pea syrup! What a unique cocktail. I'd have never thought of making the sweet pea syrup. Snap pea syrup...that sounds awesome! Snap pea syrup? Where have I been?? This sounds fantastic! Wow this is a really interesting drink. Who the heck thinks up pea syrup? I think it sounds awesome, but I'd never have thought of it! I'm in awe of such innovation! Loving the color of this cocktail! Snap pea syrup! Sounds like a great, fresh, seasonal flavoring. YUM.